I am Louise Bater, I have a First Class Honours degree in Biochemistry and am a fully assessed and accredited member of the Association of Pet Dog Trainers (APDT, UK) membership no. 01275 and member of the Animal Behaviour and Training Council as a Registered Animal Training Instructor. I am also an Accredited Handler for Talking Dogs Scentwork. I am immensely proud to have been on the dog training team for BBC2’s 4 part prime time show, Me and My Dog: The Ultimate Contest. 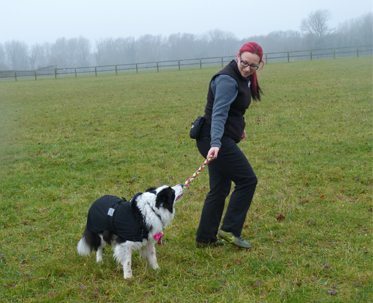 Using my scientific background and knowledge gained from the highest quality dog training instructor courses in the UK, I offer dog training classes and private in home training across West Essex and East Hertfordshire. I apply the latest knowledge combined with many years of experience in instructing and training to help you and your dog with training problems and help prevent problems from occurring. I am committed to helping owners teach their dogs to become calm and well behaved companions all in a reward based, positive way. I also offer empathy from having experienced puppyhood with my own dogs. My experience allows me to tailor teaching to the individual client and dog to obtain the best outcome and achieve your training goals faster. I also have many years’ experience training and competing in dog sports including Flyball, Agility and Canicross and I have taught Agility for a club since early 2013. 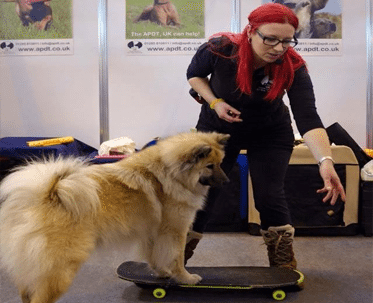 I have taken part in trick demos with my Eurasier Wilma at Crufts and Discover Dogs as well as performed at local shows with large audiences and have been a guest speaker at a number of events often taking Wilma along as a demo dog. As well as owning and running Happiest Hounds Dog Training, I am proud to be entrusted by two internationally recognised behaviourists, Sian Ryan and Chirag Patel, to run their classes and training appointments, respectively, two days per week. I am dedicated to being up to date with my teaching and invest a considerable amount of time into continued professional development to ensure I offer the best possible service to my clients and their dogs. My goal is to help clients have an easier and enjoyable life with their dogs and for their dogs to be the Happiest Hounds Around! Please feel free to contact me on info@happiesthounds.com if you’d like to ask me any questions.